The euro spent the day recovering from its decline, but just barely. The market saw some overlapping upwards movement that managed to regain only a third of the previous loss. This leaves the main count very much intact, with only a small modification to the degree of its labeling. We’re also including an alternate count that presents a different variation of the main count. By movement below 1.1149, EURUSD would be expected to find support between 1.1144 and 1.1114, while remaining below 1.1198. However, by movement above 1.1198, EURUSD would be expected to find resistance largely between 1.1201 and 1.1217, but never above 1.1239. Elliott Wave chart analysis for the EURUSD for 19th September, 2016. Please click on the charts below to enlarge. The bigger picture sees that the euro is moving sideways in black wave (B), which is forming a contracting triangle labeled blue waves A through E.
Within it, blue wave D is unfolding as a double zigzag labeled pink waves w, x and y. Within it, pink wave y is forming a zigzag labeled green waves (a), (b) and (c). Within it, green wave (b) is most likely forming a flat labeled orange waves a, b and c.
This count expects the euro to continue moving towards the downside in pink wave y over the next couple of weeks. At 1.0931 pink wave y would reach 61.8% the length of pink wave w, then at 1.0662 it would reach 100% of its length. This wave count is invalidated by movement above 1.1366 as green wave (b) of this zigzag may not move beyond the start of green wave (a). This main count sees that orange wave b is forming a double zigzag labeled violet waves W, X and Y. Within it, violet wave X formed a triple zigzag labeled aqua waves (W), (Y) and (Z), retracing a bit over 61.8% of violet wave W.
Violet wave Y is forming a zigzag labeled aqua waves (A), (B) and (C). Within it, aqua wave (A) formed an impulse labeled red waves 1 through 5. 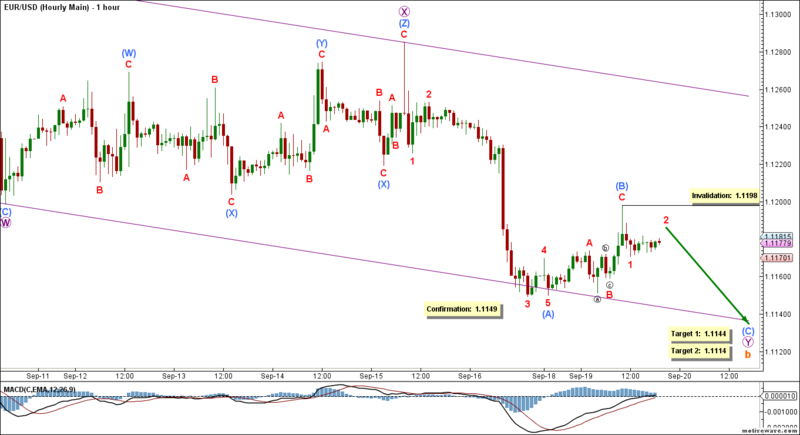 Aqua wave (B) formed a zigzag labeled red waves A, B and C, retracing just short of 38.2% of aqua wave (A). This wave is now complete. Within it, red wave B formed a flat and retraced 61.8% of red wave A, then red wave C reached exactly 161.8% the length of red wave A. Aqua wave (C) is likely forming an impulse labeled red waves 1 through 5. This count expects the euro to move towards the downside in aqua wave (C), to complete violet wave Y, and therefore orange wave b. This will be largely confirmed by movement below 1.1149. The MACD indicator somewhat supports this count by showing a declining histogram in spite of price’s making a new high. This count is also supported by the inverted hammer candlestick at what we’ve labeled as the end of aqua wave (B). At 1.1144 orange wave b would retrace 90% of orange wave a and fulfill the requirement of a flat correction, then at 1.1114 aqua wave (C) would reach 61.8% the length of aqua wave (A). This wave count is invalidated by movement above 1.1198 as red wave 2 may not move beyond the start of red wave 1. This alternate count sees that aqua wave (b) is forming a double zigzag labeled violet waves W, X and Y. 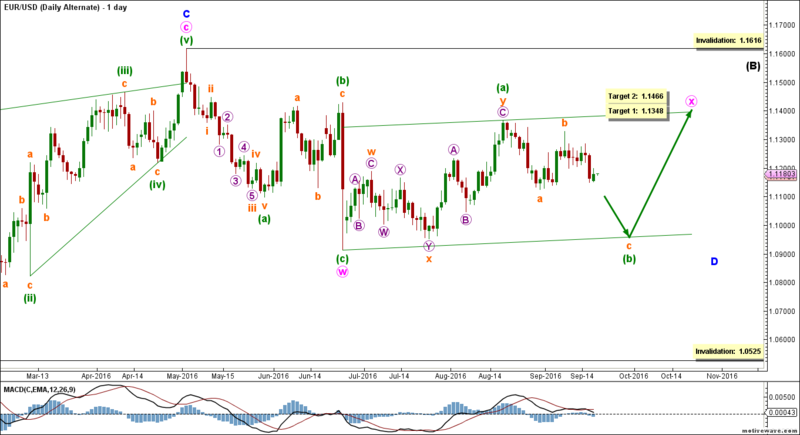 This count expects the euro to move towards the upside in violet wave Y to complete aqua wave (B). 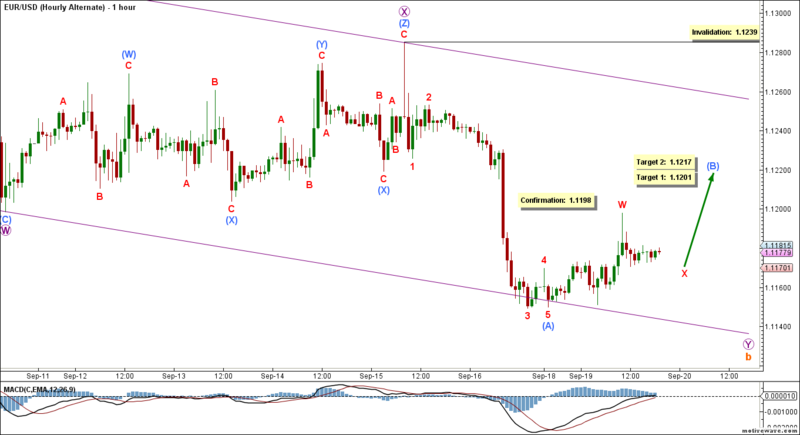 This will be confirmed by movement above 1.1198. At 1.1201 aqua wave (B) would retrace 38.2% of aqua wave (A), then at 1.1217 it would reach 50% of its length. This wave count is invalidated by movement above 1.1239 as aqua wave (B) of a zigzag may not move beyond the start of aqua wave (A). This alternate daily count sees that pink wave x is forming a flat labeled green waves (a), (b) and (c). Within it, green waves (a) formed a double zigzag labeled orange waves w, x and y. Green wave (b) is likely forming a zigzag labeled orange waves a, b and c. It should go all the way down to retrace at least 90% of green wave (a). 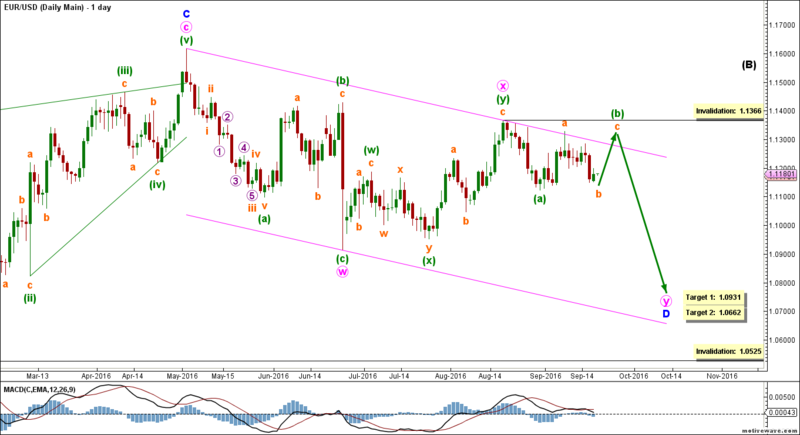 This count expects the euro to continue moving towards the upside in pink wave x. At 1.1348 pink wave x would retrace 61.8% of pink wave w, then at 1.1466 it would retrace 78.6% of its length. This wave count is invalidated by movement above 1.1616 as pink wave x of a double zigzag may not move beyond the start of pink wave w.